The General Electric M61A1 Vulcan is a 6-barrel 20mm cannon of the gatling-type. It fires standard M50 ammunition at 6,000 rounds per minute (rate selectable in certain installations). In 1947 the brand new USAF made a request for a new aircraft gun. The lesson of WWII was that the German, Italian and Japanese fighters could reach out and touch the Americans with their cannon main armament, while the latter had to get up close and personal with the .50 cal main armament of the P-51 and P-47. The 20mm Hispano carried by the P-38 was a relatively low velocity weapon. The idea of hooking up unlimited ammo to a late 19th century "Gatling" type weapon, and powering it electrically was attempted by the US Navy for use on their Torpedo/gun boats. Results were high rate of fire and a high rate of barrel wear out. With propellants of the time and period metallurgy it was a good idea but one that was not ready until new technology came along. In 1950, the US General Electric Company began designing a cannon for USAF fighters under the Vulcan Project, based on the multi-barrel concept pioneered by Richard J. Gatling in the 19th century. The Vulcan was first fired in pre-production form in 1953, and made its first flight in the Lockheed F-104. Initial problems with the gas bleed resulted in a temporary suspension of firing tests, until a better venting system for the F-104 gun compartment was designed. Today, after a period of neglect (when guns were thought to be rendered obsolete by missiles), the M61 in one form or another, is an integral part of the armament of modern fighters such as the F-15, F-18 and of course the F-16. Recently, GE's armament division was acquired by Martin Marietta, so the M-61 is now officially known as the Lockheed-Martin M61A1. The multiple-barrels cannon offers both advantages in firing rate and in barrel life. As the 6 barrels revolve, they proceed through the different stages of the gun firing cycle. Each barrel is fired as it passes through the top position, after which the spent case is extracted and ejected, and a new round is fed and chambered - all at different positions on the circle described by the revolving barrel. This means that the firing rate is multiplied by the number of barrels, as six barrels are being loaded in parallel. Furthermore, since each barrel is only fired at 1/6th of the total firing rate, barrel wear and tear is not increased. Major drawback is that ammunition is consumed at a vast rate, requiring large ammo magazines. The gun is fed through long linked belts of ammo, and although the gun appeared from early on in the development to be extremely reliable, the unprecedented rate of fire caused severe problems with these belts. The links connection the rounds often bent, broke or stretched, causing the gun to jam. Furthermore, provisions had to be made to dispose of the links. As a result, development of a new linkless feed system quickly started. Inside the drum, the rounds (tips to the middle) are placed in a giant Archimedean screw which moves them into the conveyor belt feeding the gun. In the F-16 and some other installations (M61A1 installations are tailor-made to each aircraft type), the empty case is transported back to the drum via a second conveyor belt. Both conveyor belts are housed in strong flexible ducts, and are powered by the gun, as well as the screw inside the drum which is driven via a high-power flexible coupling. Most members of the M61A1 family are driven by the aircraft's hydraulic system, or (exceptionally) by the electrical power system. 35hp is needed to drive the gun at full firing rate, and barrels rotate anticlockwise when viewed in the direction of firing. The stationary breech housing has a deep elliptical slot in its inner wall in which run 6 cam followers, on the breech of each barrel. The followers are driven linearly in and out of the associated breech, successively chambering, firing and extracting the rounds. The breech rotor, to which are attached the 6 barrels, revolves inside the breech housing. At the muzzle end, the 6 barrels are fitted in a clamp. This clamp can be replaced by other models, thereby offering a means to vary the barrel angles and create slightly different dispersion patterns. The inside of each barrel is provided with a twisted groove to give the rounds a spinning motion. The M61 installation in the F-16 encountered some initial problems, most notably in September 1979 when firing the gun was temporarily forbidden. Two incidents had occurred in which gun firing resulted in uncommanded yawing movements. The cause of this problem was an accelerometer in the flight-control system being affected by the vibrations caused by the operation of the gun. The accelerometer fed false data into the flight computers, which initiated the yaw movements. Simple insulating the accelerometer from vibration solved the problem. All 106 operational F-16s delivered to date were retrofitted during 1980. The ammo drum is located just aft of the cockpit, with the ammo loading access door in the bottom half of the starboard wing, next to the air intake. The gun itself is located in the upper port side of the fuselage, with the gun port on the port side of the cockpit. The ammo drum has a 511-round capacity. The gun controller is the electronics unit which actually controls the firing of the gun. A voltage pulse is sent out from the gun controller to fire each round in a firing burst. At the end of a burst when the trigger is released, the gun clears itself. In the clearing operation, 5 to 9 unfired rounds are cycled through the gun without firing pulses, and are fed back to the ammo drum. 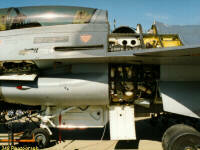 These rounds are carried for the duration of the flight as spent rounds and cannot be used. The SMS (Stores Management System) has a rounds remaining counting function which counts each firing pulse from the gun controller and subtracts these from the loaded number of rounds. In the clearing operation, however, there are no pulses or any way of determining the actual number of rounds cleared, therefore the SMS assumes 7. Due to this fact there can be a discrepancy between the rounds remaining on the SCP and the actual number of rounds left to be fired. This discrepancy can become larger with increasing number of clearings. The gun takes about 0.3 seconds to wind up to the full rate of fire, and half a second to wind down again. Some critics (notably defense analyst Pierre Sprey in a paper called First Rounds Count) argue that the aim is at it truest when the pilot pulls the trigger, and that it starts wandering off almost immediately. Therefore, the 0.3 seconds delay would cause the gun to fire just after the piper was best aligned with the target. A revolver cannon such as the Mauser BK27 (fitted in the Tornado) does not have this problem, as it reaches its maximum rate of fire instantly. A simple calculation however shows that the M61 fires 70 rounds in the first second (6,000 rounds/minute = 100/second. 30% of the first second is waisted on winding up, so that leaves 70 rounds fired in the first second). The BK27 fires at 1,700 rpm, or 28 rounds per second. In order to fire the same amount of rounds in the first second, you'd still need 3 BK27's in stead of one Vulcan - quite a challenge to fit them in the limited space available in an F-16! The rate of fire of 6,000 rpm or 100 rps means that shells are spaced by 0.01 sec. A MiG-29, with a length of 56ft 5in (17.20m) and 90° angle-off (i.e. with a direction of flight perpendicular to the direction of flight of the F-16), flying at 543kts (1,000 km/h) or 278m/sec travels 2.78m in 0.01 sec. Therefore, the Fulcrum will be hit at least 5-6 times if the aim is true (17.2/2.78=6.187). is actually from a VADS (Vulcan Air Defense System), used by a.o. the Belgian Air Force for point defense of its airfields. Unfortunately, only the .wav file format is currently available - most browser however support this format. The components that make up a complete round are a brass cartridge case, an electric primer,propellant powder, and the projectile. The projectile is fired when an electrical pulse is applied to the primer. The resulting flame passes through a gas vent leading to the propellant chamber and ignites the propellant. As the propellant burns, it forms a gas which forces the projectile through the gun barrel. The only significant difference between the five types of ammunition is in the projectile. Located at the rear of all projectiles is a band of soft metal that seats in the grooves of the gun barrel. The grooves in the barrel are twisted so that the projectile receives a rotating motion as it travels through and leaves the gun barrel. This rotation is induced to provide stability in flight. The soft band also serves to prevent the propelling gas from escaping past the projectile. The dummy ammunition color code may be either bronze or shades of gray or tan. The case will be steel or plastic. Dummy ammunition is used to check out the gun system. The M55A1 and M55A2 target practice (TP) round is ball ammunition, with a body made of steel. The projectile is hollow and does not contain a filler. The body of the M53 armor-piercing incendiary (API) projectile is composed of solid steel. The nose of the projectile is made of aluminum alloy, charged with an incendiary composition, and sealed with a closure disk. The projectile does not require a fuze because it ignites upon impact. The M56 high-explosive incendiary (HEI) round contains an HEI projectile. The round is used against aircraft and light targets. The projectile explodes with an incendiary effect after penetrating the surface of the target. HEI projectiles require a fuze which has a delay arming distance of 20 to 35 feet from the muzzle of the gun. Centrifugal force, created by the projectile spin, allows the detonator to align with the firing pin and the booster, thereby arming the round. Upon impact, the projectile presses into its target, crushing the nose of the fuze and forcing the firing pin against the detonator. The booster, initiated by the detonator, causes the projectile to explode. Starting with Block 50 (as far as the F-16 is concerned anyway), provisions have been made to fire the new 'hotter, faster, farther' PGU-28 round. It reputedly travels three times as far as the standard M53 round, effectively closing the gap between the Sidewinder minimum engagement range and the gun's maximum engagement range.